Edit: It turns out that this is actually an "extension of remarks", which means that Rep. Tancredo didn't actually say this whole spiel on the floor--rather, he had the full text added later to the Congressional Record. If you look at the actual page from the Congressional Record, you will notice that, in addition to his mention of me in the far right column, he congratulates another Fulbright recipient from his district in the far left column; a glance through the other pages of Monday's "Extension of Remarks" pages of the Record indicate that he congratulated all of the Fulbright recipients from his district; most likely, he mentioned us all together in his remarks on the actual floor of the House, and then had each of us separated out in the "Extension of Remarks" section of the record. to pay tribute to one of my constituents, Mr.
Nathaniel Campbell of Bailey, Colorado. and have proven themselves as leaders in their field. At 2:00 a.m. last Friday morning, I boarded a train from Münster to Düsseldorf in the first leg of a long, early-morning journey. While catching snippets of sleep on trains, in an airport and on an airplane, I finally returned mid-morning to the sunshine and blue skies of the urbs aeterna, Rome—just one more in the great sea across time and space of pilgrims coming to this ancient city. Yet, from the start, it was a journey filled with propitious occurrences whose import I only later would piece together. After disembarking from the plane at Rome’s Fiumcino airport, I struck up a conversation with another American who was on the plane with me while we were walking out to catch the train into the city, and in the course of our banter, it was revealed that he was the professor-in-charge at the Intercollegiate Center for Classical Studies (known as the Centro) in 2001-2002, the same small center on the Janiculum hill where I spent the Fall Semester of my Junior Year (2005). Though he now serves as Director of the Institute for Advanced Technology in the Humanities at the University of Virginia, Prof. Bernie Frischer maintains his work in the field of Classical Studies, and inquired after several members of the Boston College Classics Department whom he knows. This chance encounter served as a timely reminder of the personal connections that span the globe, reducing the vast, cold anonymity of thousands of miles and billions of faceless strangers to the concrete imminence of personal interaction. After taking the train from the airport to Termini, the main train station of Rome, I made my way on foot to the Sunshine Hostel by the Porta Maggiore in the south of the city; when Pete Heinlein and I visited Rome over Pentecost two years ago, we stayed at the same hostel, and since it was inexpensive and I was familiar with it, I decided to go with it again. Whereas my last visit occurred at the end of May during the beginnings of the busy tourist summer season, it turns out that the beginning of January is the slowest time of the year for tourism in Rome. Thus, I ended being the only person staying the hostel, not just the first night, but every night thereafter. It became a welcome place of quiet and solitude to which to escape at the end of each tiring day. After unloading my great backpack and washing my face and brushing my teeth, I set out into the city. Lindsay Wilcox and Peter Stamm, friends of mine who are currently seniors at Boston College and whose pilgrimage these first two weeks of January to Assisi and Rome provided the impetus for my own journey, were not to return from Assisi until Saturday evening, so I had two full days on my own to fill—but in Rome, that is a very easy thing to do. First, I headed up to the Basilica of Santa Maria Maggiore (St. Mary Major), one of the four great basilicas of Rome, and the first major landmark between the hostel and the rest of the city. Though almost everything that I would visit over the course of the next six days would be something I had already seen, often several times, the fantastic beauty of Rome is that there’s always something more to be gained from visiting them again. In Santa Maria Maggiore, for example, the confessio under the high altar that holds the Nativity relics had been closed for renovation each of the previous times I had visited, but was now open again. While kneeling for a moment in prayer before the reliquary, the entrance music for the 11:00 Mass in the Pauline Chapel began—Schubert’s Wiegenlied, played for the infant Jesus during Christmastide. Since I had no concrete plans (an excellent way, I discovered, to spend time in Rome when you’re not under the pressure of touristic expectations), I decided to attend the Mass. Although I know very little Italian, that which I did learn from attending Masses during my semester there two years ago came flooding back; of course, there is also the useful feature that the Catholic Mass, no matter the language or country, is the same the world over in structure and meaning. After Mass, I made my way down the Forum Romanum to sit and eat the sandwich I had packed for lunch—hearkening back to my last day in Rome during my semester there, when I similarly ate my bagged lunch in the Forum. As the sky began to cloud over, I headed over the Capitoline hill and into the heart of the city to do some more church visiting, hitting mainly some old favorites—S. Maria Sopra Minerva, where the body of St. Catherine of Sienna lies entombed under the high altar; and the churches of S. Luigi dei Francesi (St. Louis IX of France) and S. Agostino (St. Augustine), both of which contain beautiful painting by Caravaggio. Unfortunately, as I was leaving S. Agostino, it started to rain; although I had brought an umbrella with me to Rome, I had left it at the hostel (remember, the skies were clear and sunny when I arrived). Since the rain was also accompanied by the afternoon siesta during which most of the churches would close, I retreated to the Piazza della Rotondo (the piazza in front of the Pantheon) to sit with some gelato and a much-needed café latte to wait out the rain. Several hours of people watching and a hundred pages of St. Augustine’s De Civitate Dei (my current reading project) later, the rain had ceased, I had spent too much money on coffee and ice cream, and was feeling rejuvenated to continue my plodding around. I decided to make for my old stomping grounds on the Gianicolo, and found myself an hour later in the Basilica of S. Pancrazio, a beautiful but oft-neglected church by the Centro where I had often said the rosary while living there. I stumbled in during Holy Hour, so I settled in to say again a rosary in those familiar confines. By the time the Benediction was given and I returned to the streets, darkness had fallen, and I cut a leisurely path over to the great statue of Giuseppe Garibaldi and the breath-taking views from its terrace across the whole of the city. 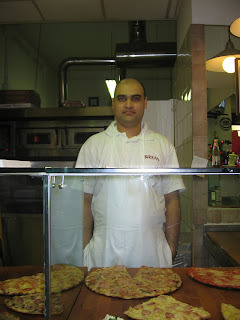 The reminiscences of times past continued as my stomach started to growl and I made my way to the Rosticceria-Pizzeria in the Piazza Rosolino Pilo that was well-known among the Centristi for its kebaps, and I made sure to get a picture of one of the owners, just to show my friends that the kebap place is still alive and well. After the kebap (which was just as good as I remembered it), the long hours and short sleep of the night before finally began to catch up with me, and I headed back to the hostel to get a good night’s sleep. Saturday morning dawned grey and wet, weather which was to stay with us for several more days. After a cappuccino and chocolate-filled croissant at my favorite café near the basilica, I entered S. Maria Maggiore to find a place to say the rosary before the eleven o’clock Mass. I stumbled, as it seemed that I so often did, upon one about to start in the adoration chapel, and so I settled in the recite the Joyful Mysteries with the little old Italian ladies. It was over the course of the next hour (for the Italians, in fine Italian form, manage to stretch five decades over a whole hour through lengthy meditations and frequent opportunities for song) that I made my first reflection on the intensely personal connections at the center of the Catholic faith, despite the global scale of a Church of more than a billion people. As I mentioned in my Christmas message, the Incarnation of Our Lord is an incredibly astounding mystery because of its personal, historical nature. Jesus Christ is an actual person, and we as Christians can have actual, personal relationships with Him. Yet, the Christian religion is not just about the personal relationship between me and Him, but it also about the personal relationship between me and you. Another consequence of the Word-Made-Flesh is that the great society of humanity is connected not just as a giant organism, a statistical unity, but also at the fundamentally personal level of one human being connected concretely to another in a relationship of mutual, Christian love. The Personhood of Christ gives the deepest and richest meaning to the personhood of every human being. It occurred to me that I have often focused so much on my personal relationship with God that I have neglected to remember that I am also in a personal relationship with other Christians. The Italians in that chapel with me were not strangers, nor was I simply the odd man out. Far more important than the fact that I couldn’t understand what the priest was saying when he was meditating upon the Nativity was the fact that, because of the Nativity, I was connected through Christ in a very real and concrete way with each and every one of the fellow Christians who were praying with me that day. To remember this personal connection and to make it a focus of my remaining time in Rome became a very important part of the rest of my journey. After Mass and lunch at a pizzeria near the Piazza Venezia, I decided to spend the afternoon at the newly-opened museum in the Markets and Forum of Trajan (a museum that didn’t exist when I was last in Rome). The major museum building is housed in the two levels of the great hall (Grande Aule), where the tabernae or shops have been converted into exhibits; between these and the tabernae reaching out from the great hall into the great hemicycle, the museum has more than two dozen rooms. 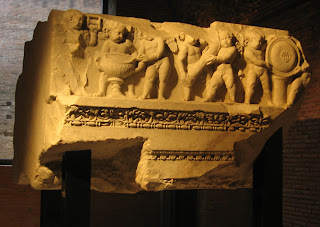 The exhibits contain various pieces of statuary and architectural elements from the imperial fora, much of it unearthed in excavations in just the last decade. For example, this is a section from the frieze and architrave from the Temple of Venus Genetrix, which is the temple that Julius Caesar erected in his forum to Venus, the originator of his line (he claimed descent from Iulus, the son of Aeneas, the son of Venus and Anchises). The focus is on the For a of Trajan, Augustus, and Caesar, and the graphic displays do an excellent job of tracing the stages of the fora, from original construction to the Middle Ages and through the modern excavations, including an exhibit on the rooms’ use at one time by the nuns of St. Catherine’s Monastery. Besides the exhibitions, one the most exciting features of the museum is the chance to walk all throughout the multiple levels of the great hemicycle that backstops the Forum of Trajan, as well as on the actual floor of the forum itself. 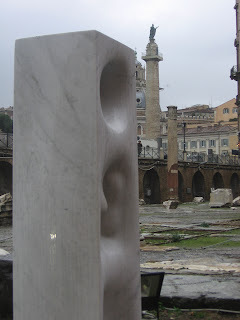 Unfortunately, the museum has extensively pursued a policy of displaying modern sculptural “art” in the midst of the ancient monuments— a practice which not only distracts the viewer from the antiquities he has come to enjoy, but utterly discredits the “artistic” concept of the modern works by placing them in direct comparison with the beauty and splendor achieved by the Romans almost two millennia ago. These modern sculptors have chosen the most spectacularly inappropriate venue to display (and augment?) the abysmally dim value of their attempts at “art”; but I suppose their egos are stroked to fancy themselves worthy to be displayed among the ancient masterworks—though in this arena, no amount of wishing can make the silk purse of the sow’s ear. The rain continued unabated throughout the afternoon, so I simply wiled away the hours wandering the cavernous halls of the markets until it was time to return to Santa Maria Maggiore to meet Lindsay and Peter. They had not had the chance that day to attend Mass yet, and were hoping to make it to a small church nestled in a back alley near the Ponte Cavour (in the neighborhood of the Mausoleum of Augustus and the Ara Pacis) that is affiliated with a group that both of them work with back in the states and which offers a Tridentine Rite Mass under the terms of the Pope’s motu proprio each evening at 6:30 p.m. Unfortunately, several wrong turns on the way over there left us hopelessly lost and too late, so we resolved instead to find a cozy restaurant near the Piazza Navonna to enjoy dinner and catch up. After dinner, we wandered over to the Pantheon and some good gelato, and then slowly made our way back up to the neighborhood around Termini, where they were staying Saturday and Sunday night. We made an early start Sunday morning, for we hoped to attend the Papal Mass for the Feast of the Epiphany in St. Peter’s Basilica—the Mass started at 10:00 a.m., so we needed to arrive about eight o’clock to hope for anything nearing a good seat. Fortunately, it being the slow season for Roman tourism, the crowd gathered more slowly than we had expected, and we snatched excellent seats more than halfway up the length of the nave and less than a dozen chairs from the central aisle. Despite the continued cloud cover and rain outside, the Basilica was brilliantly lit by the great banks of lights installed along the ceiling, allowing our eyes to feast upon the endless detail of the hulking structure. Shortly before 10 o’clock, the Sistine Chapel Choir started the entrance hymn for the seating of the great number of prelates attending the Mass, and we sang Flos de radice Iesse, the Latin original of the well-beloved English hymn I Know a Rose Tree Springing. Then, at precisely 10 o’clock, the Pope arrived at the great doors of the Basilica and made his way down the central aisle as the choir sang his entrance antiphon: Tu es Petrus, et super hanc petram aedificabo Ecclesiam meam, the same words that ring the lower part of the great dome’s drum. 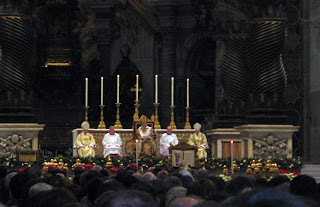 The Mass was said in Latin, though of the Novus Ordo and not the Tridentine Rite, and was on the whole a more subdued affair (though with richer music) than the great outdoor papal Mass that I attended nearly two years ago in St. Peter’s Square for the Pentecost. 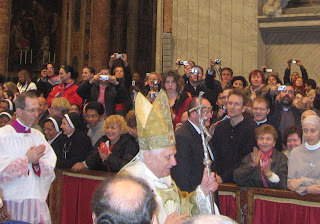 After the pontifical blessing at the end of the Mass, the whole of the congregation pressed toward the barriers at the central aisle as Pope Benedict processed out, and I was able to capture this clear photograph of him as he passed us by. We had hoped to stay in the Basilica after Mass to look around, but we were ushered out (probably so that they could clean up the chairs), so instead we joined the masses gathered outside in St. Peter’s Square for the Pope’s noon-time Angelus message and blessing—he must have been rather rushed to exist the Basilica, change, and hurry back to his rooms in the Apostolic Palace in time to give the Angelus. 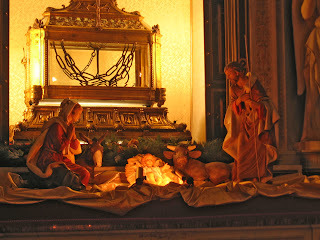 After his blessing, Italian police and firemen formed a cordon through the crowd, and through the space they opened up came processing the Three Kings bearing their gifts of Gold, Frankincense, and Myrrh to be placed in the life-size Nativity in St. Peter’s Square at the base of the obelisk—this picture of the Nativity was taken later, but gives you a good idea of how impressive it is. As the crowd began to break up, the hunger that the excitement of the whole experience had kept at bay now crept up on us with full force, and we stalked the streets to the northeast of the Vatican until we found a nice (reasonably priced) restaurant to grab some lunch. This would be a good time to note that throughout our visit, lunches and dinners were almost always leisurely affairs, owing to our generally chatty nature, the often tiring nature of our activities, as well as the generally relaxed pace that both Lindsay and Peter were pursuing—more on this a little later. After lunch, we set off on a meandering journey into the heart of the city, our only general goal being the Capitoline Hill, though with many pit-stops in between, including a long and quiet break sitting in a park near the Largo Argentine when we realized just how draining the experience of a papal Mass can really be. As evening came on, I led them on a tour of the imperial fora, and, passing the Colosseum, we ascended the Esquiline Hill to visit the church of S. Pietro in Vincoli (St. Peter in Chains), which houses the relics of the chains the bound St. Peter in prison, as well as the tomb of Pope Julius II, adorned with Michaelangelo’s famous Moses. My fellow parishoners at St. Mary’s might also recognize the figures used in this church’s Nativity scene, set before the reliquary holding St. Peter’s chains. Descending the Esquiline, we journeyed east again to our hostels to take an few hours’ rest before meeting again for dinner, which we found at an excellent restaurant in the vicinity of Santa Maria Maggiore. We met again Monday mid-morning in the Piazza Santa Maria Maggiore, Lindsay and Peter with their bags in tow, for they had checked out of their first hostel and were to move that afternoon to a B&B near the Vatican (on the other side of the city) that afternoon. 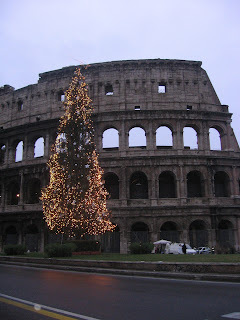 Although I had conceived of several possible programs of sightseeing tours through the city, since I was simply along for ride and to offer my experience in Rome to Peter and Lindsay, I let them make the decisions as to their itinerary. At first, I was a little frustrated at their leisurely pace, but eventually I realized that their intentions were to be pilgrims, not tourists, and that this was not to be a whirlwind trip to see as much of Rome as possible in one week, but rather a reflective journey through the spiritual heartland of Catholic Christianity. Accordingly, our two major visits of the day were to be the Basilicas of Santa Maria Maggiore and St. John Lateran, two of the four major basilicas of Rome (the other two being St. Peter’s and St. Paul’s Outside the Walls). We made our way with careful attention to every detail of the two basilicas, which are separated by just a half-hour’s walk along the Via Merulana. It was indeed refreshing and insightful for me, for though I had been often in both basilicas, I had never taken the opportunity to make such a thorough and introspective visit to either of them. After lunch at a pizzeria near St. John Lateran (the cathedral church of Rome, that is, the official seat of the Pope as Bishop of Rome—the right to say Mass at the high altar is reserved to him alone), we hopped on the Metro to cross to the other side of town so that Lindsay and Peter could check in to their new lodging. While they were getting situated, I settled down on the steps of Bernini’s colonnade in St. Peter’s Square (the rain having stopped in the night, the sun that day had dried them off) to people-watch, read a bit more of St. Augustine, and observe the setting of the sun (often a beautiful experience behind the Basilica). Shortly after six o’clock, we met again on the Ponte Cavour to attend the Tridentine Rite Mass at that small church we had tried to visit Saturday evening. This time, we did not get lost, and made it with plenty time to spare. This was, in fact, the first Tridentine Rite Mass that I had ever attended, despite my long work with the Latin language. I found it, however, neither strange nor difficult to follow, for the Tridentine Rite, especially in the Low Mass (as this was), is very, very near the Sarum Rite, from which the Anglican Rite used at St. Mary’s, my home parish in Denver, is directly taken. Hence, I was able to follow it very closely, for, other than some divergences in the prayers of the Canon of the Mass, it was an identical match to the Low Mass I have attended so many times at St. Mary’s. While Lindsay and Peter followed along in their Latin Missals, I simply followed along from memory, albeit in English rather than Latin. As the priest said most of the Mass sotto voce, and the congregation followed silently, with the server offering the responses on their behalf, there was no need for me to know the responses in Latin—though often enough, I did. Though I would not recommend the experience for everyone, I found it most contemplatively compelling, and the sight of a fiddleback chasuble and a maniple was one for sore eyes, indeed. After Mass, we grabbed dinner at a pizzeria which Lindsay had found highly recommended in one of the guidebooks she brought, and it did not disappoint. After a jaunt around the Via del Corso to find some chocolate gelato and a brief visit to the Column of Marcus Aurelius (I wanted to show them the famous “Rain Miracle” during Marcus’ campaigns in Austria, which Dio Cassius says was popularly attributed to the intervention of “Christians”), we parted ways at the Metro stop at the Spanish Steps. We met Tuesday morning again under bright blue skies in St. Peter’s Square near the Nativity, for Peter and Lindsay wanted this day to explore every square inch (no mean task) of St. Peter’s Basilica. The “off-season” for tourists proved a blessing again as the line to go through the metal detectors to enter the Basilica was practically nonexistent. We stopped first for a length of reflection and prayer in the Adoration Chapel, and then began to make our way slowly around the massive footprint of the church that was long the largest in all Christendom (I believe it was recently eclipsed by a new, massive missionary work somewhere in Africa), and in the course of our wandering, we stumbled along things that I had never seen before—the same phenomenon as the previous day manifesting itself, as I had never properly taken the time to investigate each and every of the side chapels and altars. This being the heart of Catholic Christendom, it was no wonder that around each corner lurked a new and delightful surprise—the bones of St. Gregory the Great here, the relics of St. John Chrysostom there (and a delightful inscription noting that not twenty years ago, Pope John Paul II had donated some of them back to the Orthodox Patriarch of Constantinople, Bartholomew I). After the floor of the Basilica, we made our way down into the grottoes beneath to visit the tombs of various popes housed there, including that of John Paul II and the window into the confessio holding the bones of St. Peter. Finally, we made the intrepid journey up the more than 1,000 steps to take us to the observation deck along the top of the dome’s cupola—unfortunately, we had little breath left for the views from up there to take from us. Upon our descent, we discovered we were in need of a break, for our legs were a bit wobbly after the whole ordeal, so we found another nice pizzeria off the Via della Conciliazione for lunch. After lunch, we took to people-watching in St. Peter’s Square for a while, until 4:30, when we met Msgr. Anthony McDaid for some coffee. Msgr. McDade is a delightful Irishmen currently assigned to the Congregation for the Clergy in Rome; some years ago, he served with the Archdiocese of Denver, where he became good friends with Liz O'Malley, who also happens to be a good friend of my grandmother’s. When I left to study in Rome two years ago, Msgr. McDade’s name was passed along, and we’ve now managed to go three for three in visiting each other each time I have been in Rome. After coffee with Msgr. McDade, we met again for Mass at that little church tucked away by the Ponte Cavour, and I discovered that this second time offered me a different experience with the Tridentine Rite. 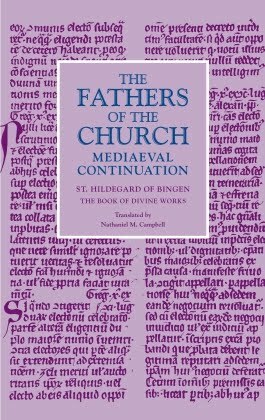 The previous night, I had gotten caught up in recognizing each element of the Mass so familiar to me from the Anglican Rite; this time, I was able to focus more on the uniqueness and beauty of the Latin Rite on its own terms. We returned to the area on the west side of the river near Lindsay and Peter’s B&B for dinner, where we found a wonderful restaurant that looked far more expensive than it really was—brocaded tablecloths and charger plates on the tables, yet still within the price range of three college students. We also had a wonderfully inquisitive waiter who was quite curious to hear about various aspects of our lives in America (I saved the fellow the confusion of trying to explain my current residence in Germany). Finally, we parted company for the night and I hopped back on the Metro to return to my side of the city for my last night in Rome. I woke a little earlier on this, my last day in Rome, for I needed to pack everything back up and make sure I didn’t leave anything behind, for once I set out, I wouldn’t be returning to the hostel, or at least not during this trip to Rome. I met up with Peter and Lindsay once again in St. Peter’s Square, for this morning’s agenda was another thing which for me would be a new experience: attending the weekly General Audience of His Holiness Benedict XVI in the expansive Paul VI Auditorium situated to the south of St. Peter’s Basilica. It was again a sign of the “off-peak” season that the auditorium filled rather slowly and not, in fact, to capacity. The tickets for the audience, which are “entirely free”, as it says on them, we acquired the previous day when visiting the Basilica—after one passes through the metal detectors and before turning right to head up to the Basilica, one passes on the right the entrance to a large set of stairs and a great hallway leading back into the Apostolic Palace and guarded by Swiss Guards in their Technicolor garb; after gathering up the nerve and explaining your purpose to the police officers standing at the base of the stairs, one member of your group ascends and asks the Swiss Guard on the left for the tickets, which he will retrieve for you. A bit of a production, but completely worth it, as we discovered on Wednesday. While waiting for the audience to begin, we took in the cavernous hall, the Nativity and Christmas Tree set up on the right of the stage (the tree’s lighting changed every few minutes, cycling through blue, red, yellow, green, and purple), and enjoyed the boisterous music performed by what turned out to be a group of Italians in native dress with drums and mandolins and tambourines. At 10:30 sharp (while most Italians seem to shy away from starting anything on time, the Pope’s schedule runs like clockwork—he is German, after all), Pope Benedict entered the hall to thunderous applause, and after an opening prayer and reading, he offered his address. Though it was in Italian, I was able to follow the general gist of the twenty-minute lecture (I continually felt the urge to take notes—I suppose you can take the Pope out of the classroom, but you can’t take the classroom of this Pope, at any rate), and my suspicions were confirmed when he offered brief three to five minute recapitulations in French, English, German, Spanish, and Polish (though the last was read for him by a Polish bishop): he gave us a general overview of the life and writings of St. Augustine, promising to use the African bishop as the baseline for his addresses in the weeks to come. While he read the English version verbatim from the paper in front of him, he took several detours from the script when proffering the German version, including several lighter moments (“The metropolitan in Africa called Augustine back to the see at Hippo because he was in need of good preachers, since he himself wasn’t one”). 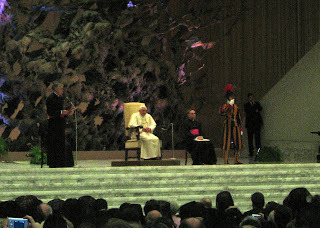 Before he offered his remarks in each language, he was introduced by a bishop or priest in that language, who also introduced the registered groups of pilgrims from that particular language area in attendance at the audience; after the English-speaking pilgrims were introduced, a church choir from Massachusetts sang a setting of the Angelus, for which the Holy Father later thanked them. 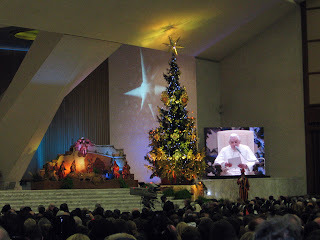 After concluding his remarks, Pope Benedict led the hall in the recitation in Latin of the Our Father (printed on the back of the tickets for those who didn’t know it Latin), and offered a blessing that he extended to the families of all in attendance, with special intention for the sick and ailing. We made our way back into the sun-drenched expanse of St. Peter’s square, and as I had only about a half-hour before I had to leave for the airport, we grabbed some panini sandwiches from a street vendor and enjoyed our last few minutes together. We made our goodbyes, I wished them all the best on the rest of their pilgrimage (they will be in Rome through Sunday), and set off again for the airport, my Epiphany journey to praise the Lord together with Melchior, Caspar, and Balthasar complete.